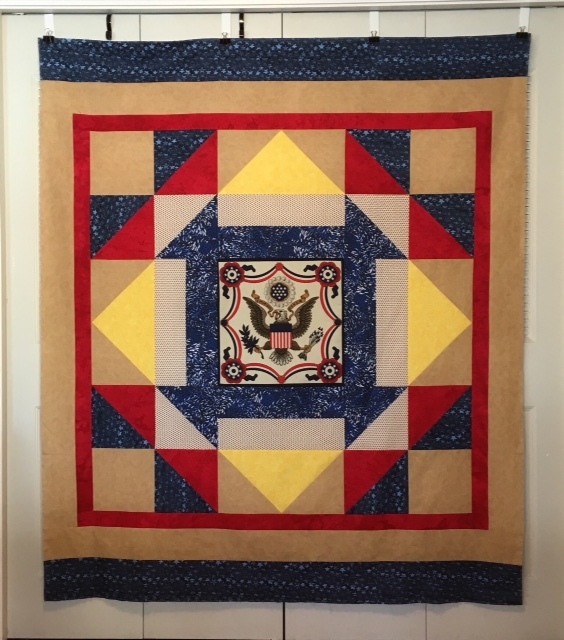 The center of American Spirit is one of the patriotic napkins I purchased at a quilt silent auction in 2017. Because of the bold contrasting colors, the quilt has a distinct Native American tone. I adapted the design from a pattern called Flannel Roses (pages 28 - 30) in Evelyn Sloppy's book, Sew One and You're Done. One of my UFO challenge goals for this month is to make Quilts of Valor from the napkins. I'd say you nailed this one! The colors are really striking! Nice to hit a goal so early in the month! I like how the tan edging almost looks like leather. What a great idea to use the napkins as a center quilt block! The napkin makes an ideal center and I love the bold colors you used. Nice job! I love the blue border top and bottom. NICE JOB Nancy again and again you finish winners. So striking. I love the pop that the yellow brings to this. It really does remind me of a Native American design. Just lovely - well done! What a great idea. This quilt is wonderful. It's a great idea to use those napkins in quilts. Great job.